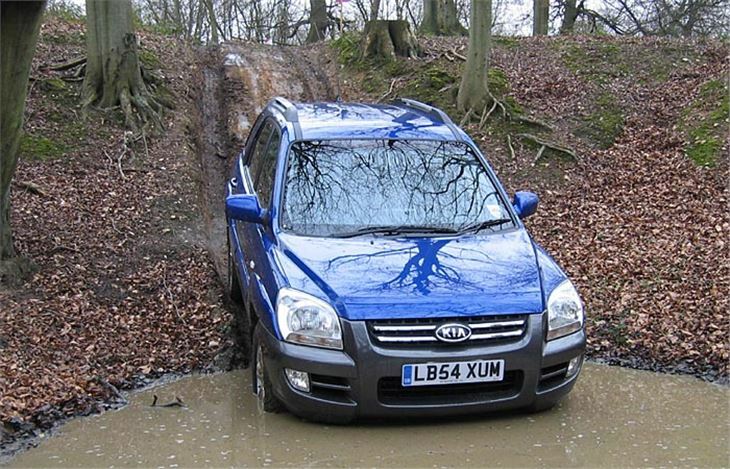 The first nice surprise when you step inside the 2005 KIA Sportage is the smell. There isn’t one. Interiors of cars from South Korea used to pong like a glue factory, but thankfully the Sportage is an odour-free zone. It retains a few other bugbears, though. The indicator switch is on the right. It has a fiddly DIN fit radio/CD with a cheesy ‘welcome’ display. And until you get used to them the ergonomics feel all wrong. It doesn’t fit around you the manner of a modern motor. 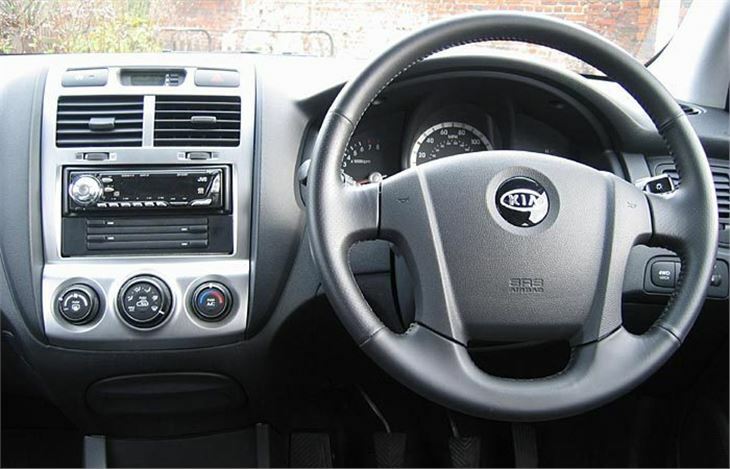 The gearlever, parking brake and steering wheel don’t all naturally fall to hand. However, with one further reservation, that’s all the bad bits done and dusted. It’s a very impressive SUV. The back seats are especially good. Just pull the catches on the top and the squabs move forward as the backs come down leaving a flat load area very quickly indeed. 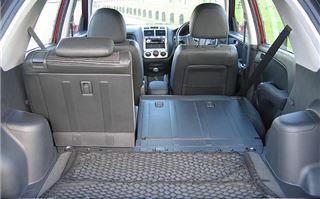 As well as that, the back seats recline slightly, as in the Nissan X-Trail, enabling rear seat passengers who already enjoy plenty of legroom to sleep a long journey away. And in a £15,995 car, leather comes as standard. The rear hatch of the XS has a separately opening window, as on some Renaults. Unlike Renaults, the button switches are clearly marked and easy to find. The big surprise is, just like the Hyundai Tucson of which it is pretty much a badge-engineered clone, it handles brilliantly for an SUV. 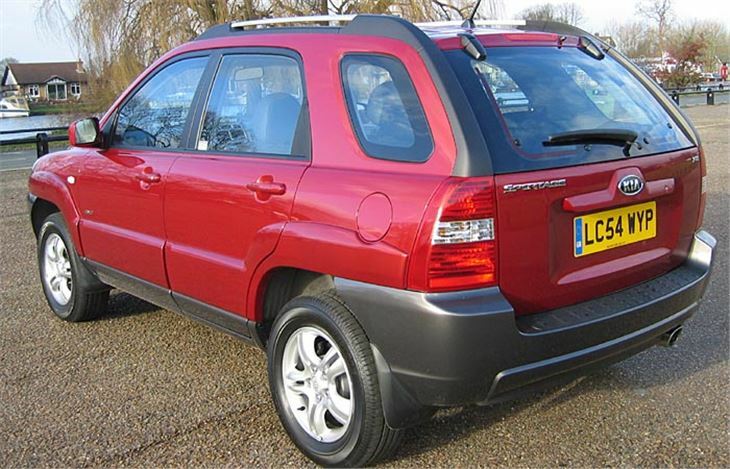 It doesn’t lumber like a Freelander, it isn’t overlight like a CRV. The steering is pleasantly weighty. It grips as if the front wheels have claws, and you can fling it around like a RAV-4. You quickly learn there is a huge blind spot at both rear three-quarters which is mostly compensated for by big, convex mirrors. However, as the warning states, what you see in them will be ‘closer than you think’ from experience of normal door mirrors. And, despite quite low gearing of 22.5mph per 1,000rpm in 5th, the 2.0 litre petrol engine doesn’t give you much go. I’d guessed the 2.0 litre diesel would be the engine of choice, and that was confirmed when I got to drive it in February 2005. First, off-road on two courses through some woodland both with M+S and more roadgoing snow tyres. 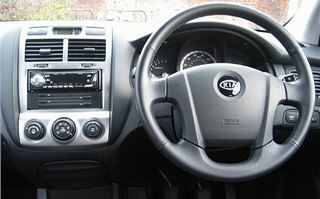 There is a selectable centre diff lock and, on XS versions, a Traction Control System which you can leave on or switch off. With bags of low-down torque from the diesel engine, the car romped through both courses, accomplished some steep ascents, descents and back-breakers and only got stopped once when I didn’t give it enough welly on an uphill hairpin through some trees. Once I backed up and went for it again I was through. So, very impressive off road. On the road I first tried the diesel automatic, which is competent rather than exhilarating. Though it’s fine in the suburbs and will cruise all day at 80, main road overtaking is not its forte. 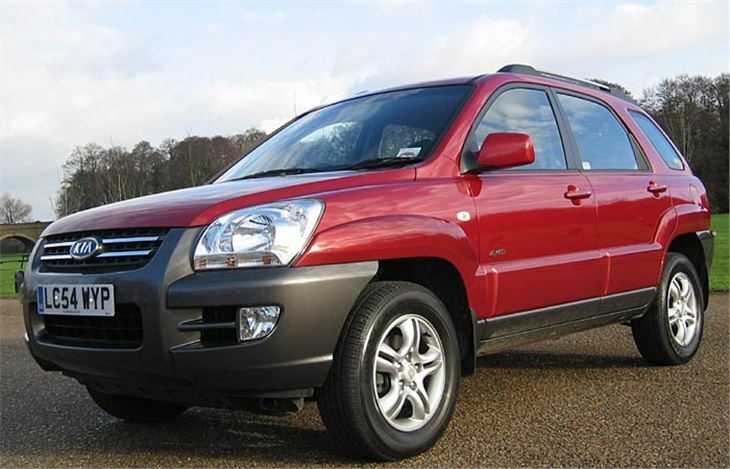 However, it is a diesel automatic compact 4x4 SUV and there aren’t many alternatives: only the almost identical Hyundai Tucson, the Suzuki Vitara and the LandRover Freelander TD4. 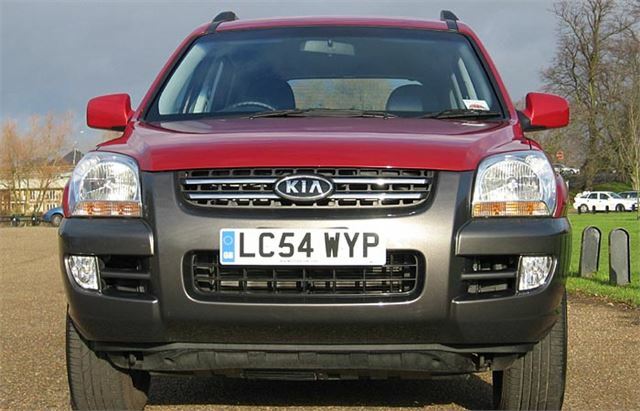 Pick of the bunch for value has to be the Sportage 2.0 diesel XE manual at £15,695. Geared at around 27mph/1,000 rpm it’s a bit slow accelerating but will hold 80 – 100 with plenty of steering feel and stability at that sort of speed. 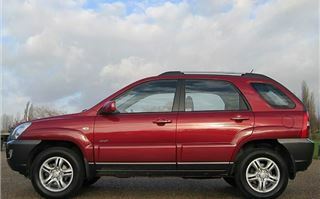 It’s not as quick or as smooth as the £3,000 more expensive Honda CRV 2.2i CDTI but the steering is sharper and the brakes are really excellent. And it’s a comparatively low Insurance Group 9D. 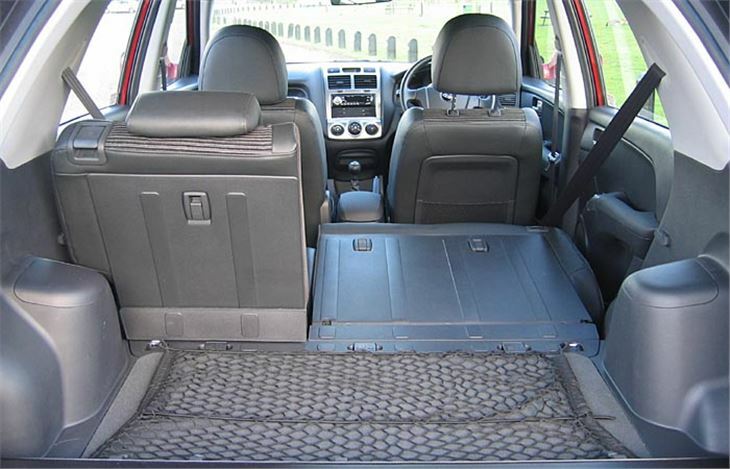 So the Sportage is a good vehicle, with a top of the class rear compartment, it’s well equipped and it’s very good value for money. 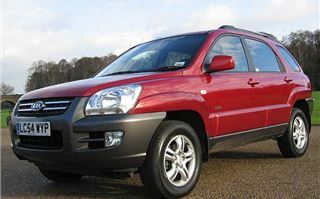 For the money its only competitor is the Suzuki Vitara and the basically similar Hyundai Tucson and it’s streets ahead of the Vitara. 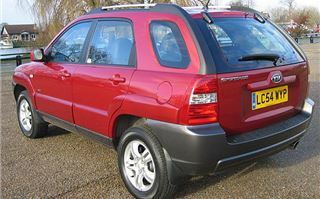 It makes CR-Vs, RAV-4s and X-Trails seem expensive, Freelanders look overpriced and X3s silly money. It looks good too. Especially those dual rear exhaust pipes.